We all knew there would eventually come a day when self-driving cars would start roaming US streets without someone in the driver's seat for safety, but you might be surprised that the day has come this soon. In fact, Google's self-driving cars passed that milestone a couple of weeks ago. As The Verge reports, Waymo, the self-driving vehicle company owned by Google parent company Alphabet, has been letting autonomous cars rush over the roads of Arizona without someone in the driver's seat since the middle of last month. The news confirms rumors we reported in October. Waymo CEO John Krafcik shared the news at the Web Summit conference in Lisbon, Portugal today. Krafcik also announced that Waymo wants to start using the technology for a ride-hail service in the style of Uber or Lyft. This is all possible in part because Arizona hasn't bothered slapping heavy regulations on autonomous cars in the manner of states like New York, which has allowed – appropriately, considering the location – a 'Wild West' approach to testing. Arizona's laws regarding autonomous cars are so lax, in fact, that Waymo isn't even required to report accidents its cars have. or how many times the safety driver had to grab the wheel. Fortunately, there's apparently no reason to be alarmed, at least if you take Waymo's word for it. The company recently released a huge safety report that claimed its cars had driven 3.5 million miles over public roads and 2.5 billion in simulation. All of these miles went by with relatively few hitches. 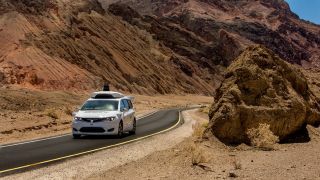 If you're from Arizona, however, don't expect that this means you'll be able to hitch an autonomous ride from Tombstone to the Grand Canyon anytime soon. Waymo's cars will initially be limited to a 100-square-mile zone around the Phoenix suburb of Chandler, although that radius should naturally increase as Waymo undertakes more research. For now, you'll also have to be a member of Waymo's Early Rider program to join in the fun, and you'll also still have to deal with a Waymo employee hanging out in the car with you – although he or she will likely be sitting behind the driver's seat rather than in it. Still, Waymo believes it's ready to take this step because of the impressive technology in its cars. "Everything in [Waymo's autonomous cars] is designed and built for full autonomy," Krafcik said. "Our combination of powerful sensors gives our vehicles a 360 degree view of the world. The lasers can see objects in three dimensions, up to 300 meters away. We also have short range lasers that stay focused close-up to the side of the vehicle. Our radars can see underneath and around vehicles, tracking moving objects usually hidden from the human eye."